The previous video for the song hadn't been too shabby either - featuring the Notre Dame Marching band and no cuts. The incredible new video, which is all about one of those "what happens next machines", was apparently made without CGI (although I had my doubts at first and will be watching for online discussions on the subject), and has turned viral immediately - already over 1 million hits in 2 days! According to the YT page, the video was directed by James Frost, OK Go and Syyn Labs and produced by Shirley Moyers. It was filmed in a two story warehouse, in the Echo Park neighborhood of Los Angeles, CA. The "machine" was designed and built by the band, along with members of Synn Labs over the course of several months. A little less flashy, yet for me personally more significant, is the beautiful and heart-warming new video for the song "Einer von Zweien" by the German band Ich + Ich featuring the full band (for the first time) and a group of marathon dancers (literally I'm sure, considering how long a video shoot lasts). My dear friend Thimo Sander plays guitar in the band and, by coincidence, on my recent trip to Berlin I also had the pleasure of meeting Ingo Georgi, one of the owners of Katapult Filmproduktion, the company that produced the music video. Congratulations on a great video! Unfortunately, the video "Einer von Zweien" so far only seems to exist within the embedded flash player on the band's official website. There's no option to embed it on a blog or other site, nor could I find it anywhere else. While offering the option to share a link via Twitter, Digg, etc., the marketing team of the band/record doesn't seem to want the video itself existing anywhere else than on their destination website. Or are their hands tied? It's the total opposite approach from OK Go, who will probably get a lot of new fans again through their viral video strategy. Ich + Ich is one of the most popular German bands right now, if not the most successful German band altogether, so I don't think they have to worry about their sales or fan base. But you still have to wonder... And I do personally think it's a shame that we can't share the video with others, because it really is a beautifully shot, choreographed and edited video for a moving song. And I wonder if the restriction on sharing the video is due to their record label (or GEMA, the royalty collection group) not wanting other websites making money off of their content, a contemplation and past actions that have caused heated debates in the German music and online communities. 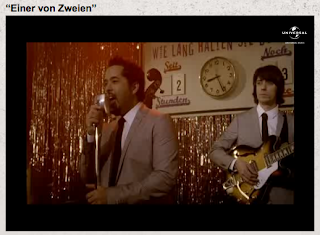 If the video for "Einer von Zweien" becomes available as an embed or at least as a direct link, I will add it here. Until then you can find it as part of the video page on the Ich + Ich website. In an interesting twist on the whole tale of embeddable/viral or not, Scott just sent me several links regarding the first OK Go video for the song "This Too Shall Pass", which apparently at first was not embeddable either (that YouTube/label conundrum again) and thus caused a bit of a stir and discussion.